Is it just me, or is designing a wall with a big fat TV in the middle a little difficult? Last year, we were fortunate enough to be able to purchase our first flat screen TV (thank you x-mas bonus!) and while we love that our new TV is thin enough to not spill over the edge of it's stand, the wall decor around our TV has been a bit of an issue. Not too bad right? But, what you aren't seeing is the vast amount of negative space I sneakily cropped out of the picture in order to make things appear more balanced (notice you can't even see the tops of the door frames). I was thinking it would be nice to bring the wall art down so it meets the height of the TV and then add a sleek bookshelf over the top (sort of creating a built in entertainment center look without having to actually buy one). I can't decide if the bookshelf is "too much." My awesome husband has already starting cutting the wood to make the shelf...but we are both feeling a little skeptical about the decision. I think it looks great with a bookshelf!! DO IT!! :D and show us the after photos? I think the shelf is a great idea, but maybe you could prevent it from looking too "heavy" by breaking up the books/DVDs with some pretty objects. As long as the shelf isn't too full, I don't think it will be too much! I think the shelf looks great and I am sure you would find the perfect things to go on it. I've always wanted some kind of huge distressed looking tv cabinet (so I could close the doors and hife it away). Tv's are getting so huge and wide it might have to be gigantic then looks way to weird or bulky. Ahhh, who knows. But I really like your idea! I love the shelf! I agree with Amelia though - maybe break up the books and DVDs with pretty objects. But the shelf really does make the space complete! 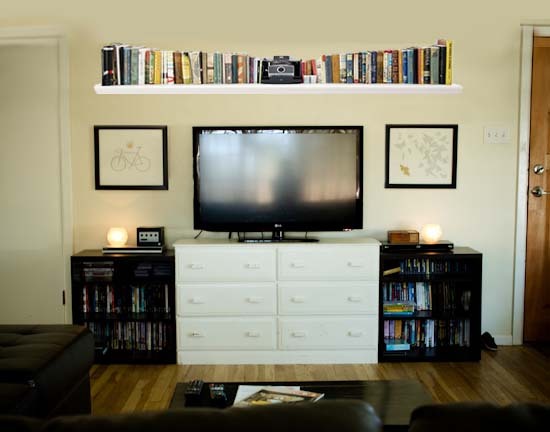 I'd put the shelf and remove the frames so it doesn't feel so crowded, they can distract the attention from the TV too. Besos! The shelf looks great! I love a busy wall and especially a bookshelf. The focus will be off the TV and on all the nice things you have on the wall. I have the vast expanse of blank wall problem too! I LOVE the bookshelf. It's definitely not too much. Go for it! Also, as you probably know, it is Breast Cancer Awareness month. I would really appreciate it if you checked out my most recent post about how you can help my cause to further research and awareness! Save the ta-tas! Adding the bookshelf definitely makes it all look more balanced! We don't have a flat screen yet, but like you I do notice how they tend to be the focal point in most rooms. 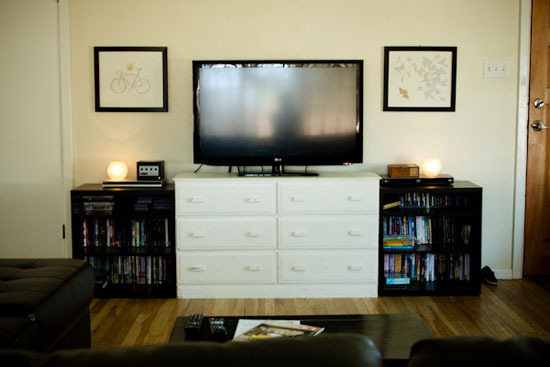 From time to time I'll look at how to minimize it without having to buy a cabinet or expensive hardware (like the kind that flips the TV over) and I think I like this idea the best...http://fullofgreatideas.blogspot.com/2011/03/picture-perfect-tv-flat-screen-tv-frame.html. With more hung around it I think it could have more of a picture gallery look. I love the shelf! And, it can act as a mantle stand-in if you don't already have one.